I love to read and am always on the lookout for new authors. 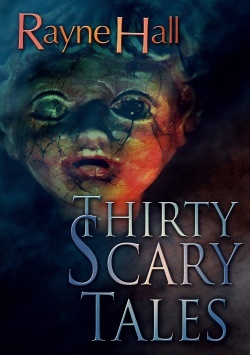 I was given the opportunity to read and review Thirty Scary Tales by Rayne Hall. This is a wonderful book. The author has a very creative imagination and the short stories not only hold your interest, but make it so you don’t want to put the book down. You feel like you are in the middle of each story because the descriptions are so vivid. The twists at the end of some of the stories left my mouth hanging open. What I liked most about this book is that after each story, the author told you what her inspiration was for writing it. This is a very unique perspective which I appreciated. My favorite story was how far one woman would go to get the man she desires. Clever storytelling there. I also enjoyed the historical settings of many of the stories. I highly recommend reading this book and I look forward to reading more books by this author. Rayne Hall's books are available at Amazon.com, Barnes and Noble and other ebook retailers.